You may also want to check our cold laser regulations for clinics and practitioner using a laser in their business. This guide includes high power lasers including both Class 4 lasers and higher-power Class 3b systems which are technically not "cold." The lasers in this guide all have the primary goal of photobiomodulation. 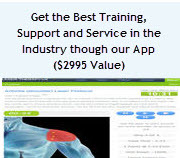 Cold laser therapy is a premium market with some professionals charging up to $250 per session but marketing the cold laser part of your business can be tricky so we provide custom marketing literature with every professional system over $5000. We will create custom marketing literature with your name and logo on it. We will send you the originals, so you can edit or print them. Many practitioners and laser sellers advertise for "increased healing" but that is technically not an FDA-cleared claim, even if it is the main goal of most therapies. Considering that 28% of Americans are in pain at any one time and even more have long-term physical challenges, there is a big market for cold lasers for pain control lasers since they can be tremendously helpful for people with the above problems. As a professional, you can buy a laser and advertise services focused on the above 4 approved applications. However, you cannot advertise for any off-label applications. In other words, you cannot advertise that you can do cosmetic enhancement or cure cancer using a therapeutic cold laser. After you buy a cold laser, you are free to experiment with any application, you just can't advertise for the service. The lasers we sell are NOT intended for use for hair growth, cosmetic enhancement, weight loss or cosmic alignment of your chi. Our products are for the applications listed above. We also sell an FDA cleared Toe nail Fungus treatment kit for the Aspen lasers. Before we get into the bulk of the office style lasers, I want to make a quick reference to a unique product called the MR4 LaserStim. 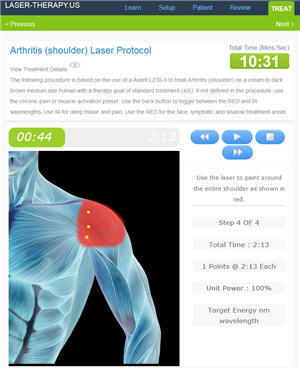 This product is unlike the other products listed below because it is a laser, an e-stim device and a diagnostic tool. This laser has a much better ROI in many cases because it simultaneously does e-stim and laser so you can bill insurance companies for both a 97026 (IR therapy) and 97032 (e-stim) essentially doubling your income if you work with insurance companies. For anyone who does not have or want to buy an X-ray machine, the diagnostic tool can help find problem areas like a herniated disk or damaged muscle. These 2 factors together give the MR4 LaserStim one of the highest returns-on-investment. Outlined below are the 11 criteria you to consider when shopping for a therapeutic cold laser for your office. Our recommendations are listed in the box after each section. 1. Pinpoint or Broad Probes - If you need your system for trigger point or acupuncture therapy including smoking cessation, laser acupressure or working on hands, you might want a pinpoint probe (emitter). These emitters allow high photon density (up to 167.4 J/cm2/minute) in a concentrated area. If you need to treat muscles, bones and tendons, you want the largest probe diameter possible. Saturating a damaged quad muscle with a small emitter is like trying to color a full sheet of paper with a ball point pen. Many flexible systems, like the Apollo and TerraQuant, allow both styles of probes to be attached to the controller while allowing for minimal time switching between these two very different therapies. Many of the higher-end units are broad probe only. If you need a pinpoint probe, your choices are Avant, Apollo, PowerMedic and Vectra Genisys. The TerraQuant products offer an adapter for use as a pinpoint. The other products are all broad emitters only. 2. Wavelength - About 80% of cold lasers operate in the 800nm to 980nm wavelength for therapeutic treatments. There are several manufacturers (like Erchonia) that operate mainly in the 600 to 680nm wavelength range. Top brands, such as TerraQuant, Thor, Avant, and Vectra Genesis, operate in both ranges which can add to the cost of the device. The following table shows wavelengths for a single piece of equipment and controller/probe packages. Several manufactures sell equipment where you can choose from a variety of wavelengths, but the unit is built to operate at one wavelength (Nexus). The Q1000ng™ was shut down by the FDA. 3. Pulsed, Continuous, and Sweeping Waves - Pulsing a laser can provide an addition stimulator effect in addition to just a simple dosage that you get with a continuous wave laser. Pulsed and sweeping waves also allow for higher power levels while still being safe since the tissue and the laser can cool down between pulses. Continuous wave lasers saturate the damaged area faster which is better for pain control. About 80% of manufacturers offer pulsed waves and they typically advice the use of pulsing waves for better long-term healing. Some systems sweep the pulsing frequency through a range (like 1000 to 3000Hz) so that if there is a harmonic or natural frequency that would have the strongest reaction, the system emits that frequency at part of the time during the therapy. Shorter treatment times mean you can help more patients and make more income. If the power is too low, the treatment might not ever get enough energy density into the tissue in a reasonable amount of time. Some manufacturers of lower power devices have short treatment times, but they are based on minimizing treatment time and not optimizing healing. These systems typical generate very low energy densities that will still help but it can take months or years to get the problem corrected. In addition to achieving optimum healing in a faster time, high power systems provide short intense blasts that are better for pain control. If your budget will allow, it is best to buy a device that has some power to spare. 5. Safety Versus Power - Cold Lasers are broken into 4 classes based on their ability to do damage (mainly to the eye). Class I lasers are safe enough to be used in the home while class 4 lasers can be dangerous, even for office use, if not used properly. Higher power class 4 lasers provide the most flexibility, yet this advantage may be offset by the additional risk and liability of having such a powerful piece of equipment in your office. Keep in mind "With great power comes great responsibility". 6. Unattended Operation and Portable units Lasers come in a variety of form factors include handhelds, battery operated portables, and desktop units. Desktop units can usually be installed on a cart with an articulated arm for unattended operation. Depending on your office layout and patient load; you might prefer one form factor over another. Class IV lasers are less likely to require unattended operation since the treatment times are typically very short. 7. Flexibility and Ease of Use: For some practitioners, the cold laser is a supplement to their overall business. In this case, ease of use is a priority since you don't want to put huge effort into mastering the cold laser. For others, the use of a flexible laser will allow significant expansion of their business. Regardless, we can assist in finding a unit that meets your needs. We understand that busy professionals don't have 20 minutes per patient to research treatment plans or enter individual variables into a cold laser controller. 8. Protocol Accuracy Every laser is only as good as the protocols that come with it. Many older systems required a PhD to find a good protocol and get it entered into the system. These days, the best lasers have "cookbook" style protocols or a graphic menu where users can quickly find a protocol for each patient. There is also more to the protocol than just documentation, the accuracy and repeatability of the protocol can have big impact on efficacy. The higher-end equipment will measure the output of the laser beams and adjust the power to make sure that every patient gets the optimum power, even after several years of use when the beams start to drop in power. Thor claims to have the industry's most accurate protocols, but they require that you return the laser annually for recalibration. Self-Calibrated units include the Avant are a better option. The Apollo and K-laser have calibration ports built in. 9. Warranty The industry standard warranty is 2 years. Only the Quantum Wave laser has a 1 year warranty. The Avant, Nexus and Vectra Genesis have a 3 year warranty. All the manufacturers will repair the units after the warranty period. The warranty is more critical on higher end units because the lasers are more prone to burnout at higher levels. The cost of repair is also higher for the more expensive units. Avant has a 3 year warranty. The K-laser Cube+ has a 5 year warranty. Thor has a 5-year warranty but requires the laser be returned annually for an expensive calibration to maintain the warranty. The Quantum Wave laser has a one year. Most everyone else offers a 2-year warranty. 10. Aesthetics and Form Factor The aesthetics and form of the device are important to both the practitioner and the patient. For practitioners, a well-designed product allows them to focus on their patient and not the equipment. For patients, a professional grade desktop machine often has a big "WOW" factor that give the patient confidence that they are getting the absolute best treatment. There is a big difference in customer perception if you compare using the ML830 (which looks like a flashlight) to the Nexus (which has a huge full-color graphic touchscreen). Checkout the K-laser and ML830 to see the opposite ends of the spectrum for aesthetics. Erchonia offers systems in your choice of colors. The EVOlaser offers similar form factor to the K-laser. 11. ROI and Good Will - Every successful practice must have a good return on their investment but often there is indirect result of owning a great cold laser. More expensive machines allow for more flexibility and can mean better efficacy for a wider range of patients. The patients that see great results talk to their friends and this can often bring in more business and build your reputation. When you do your financial analysis, don't forget to factor in some good will. When it comes to cold lasers, you really do get what you pay for. The TQ solo is worth considering because of its exceptionally low cost. The Avant is the best bargain in the Class III group. The Apollo provides medium power. The Eltech K-laser (by Chattanooga) provides extreme power, flexability and super high quality. Below is a comparison of different lasers and their key specifications. The table includes several popular models that we do not sell, which we neither recommend nor discourage the purchase of these devices. These units have been included so you may see all your options. We have included some units that are not marketed based upon the 4 FDA general principals of photobiomodulation. This includes products based on scalar waves and quantum waves. These companies tend to keep their specifications a secret, therefore some information is missing. As you can see, there is not one ultimate system. Each system has advantage and disadvantages. We are happy to help you through this decision and fine the laser that best meets your needs. Call us anytime at 1-800-388-0850. NOTE: CW stands for continuous wave. All the specifications are correct to the best of our ability. If you find an error, please let us know. Wow, that was a lot of data and a lot to think about! We hope it helps you compare apples-to-apples. Think about your priorities and conclude what is the best cold laser for your office. If you are still struggling to decide, please call us at 1-800-388-0850. Consider, however, these final recommendations. The TQ Solo is always worth considering. Even though it mainly is a consumer unit, it is the lowest cost unit that still has similar specs to the industry average and it is a good way to get your foot in the door. The Avant offers the best balance between healing and pain control with great flexibility and a great ROI. The Eltech K-laser Cube by Chattanooga is the top laser in the class 4 arena and the EVOlaser is lower cost clone of the K-laser. It has more of everything you want in a therapeutic laser and is priced much less than comparable class 4 cold lasers.